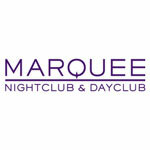 Marquee Las Vegas at The Cosmopolitan promises to be the most spectacular new space in Las Vegas. Marquee Las Vegas is more than 62,000 square feet, with 50-foot-tall ceilings and an unparalleled multi-million-dollar sound stage designed to cater to any performer’s whim. Coliseum-style seating surrounds a focal dance floor, where one can marvel at the four-story LED screens and projection walls that will display customized light and image shows distinctly tailored for each performance.